The life of Tomoyo Aki, a highschool otaku working part time to support his BD hoarding. With remarkable luck, he bumps head-first into, Megumi Kato, the most beautiful girl he has ever seen. Naturally, the meeting twists his life into a complicated torrent of relationships. Eriri Spencer Sawamura, his half-foreigner childhood friend who's always valued her relationship with MC. 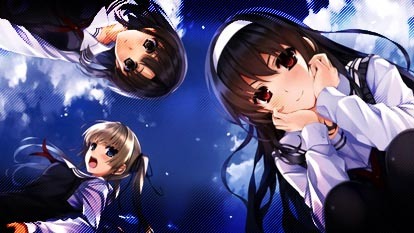 Kasumigaoka Utaha, a cold, composed renowned literary genius who shoves everyone aside from our protagonist. What is this? An eroge introduction? The tale of a small not quite doujin circle, but not quite indie studio's journey through the tough territory of comiket and beyond.